I mean, Alien or not, what else are you going to put eggs in other than an egg carton? The set of six eggs — three unhatched, and three hatched, complete with little face huggers to crawl out of them — will be available later this year from NECA, for an undisclosed price, having being revealed over the weekend. But honestly, the eggs themselves are almost ancillary to the packaging. 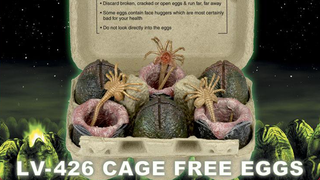 It’s not even just an egg carton, it comes with Alien-themed opening instructions warning you of the very obvious dangers involving the consumption of eggs that contain face huggers. That sort of silliness I can get behind. Also, you probably shouldn’t eat these anyway, because they’re plastic toys and you’d probably choke to death. So it’s double the warning!